June 12, 2012 By This post may contain affiliate links. 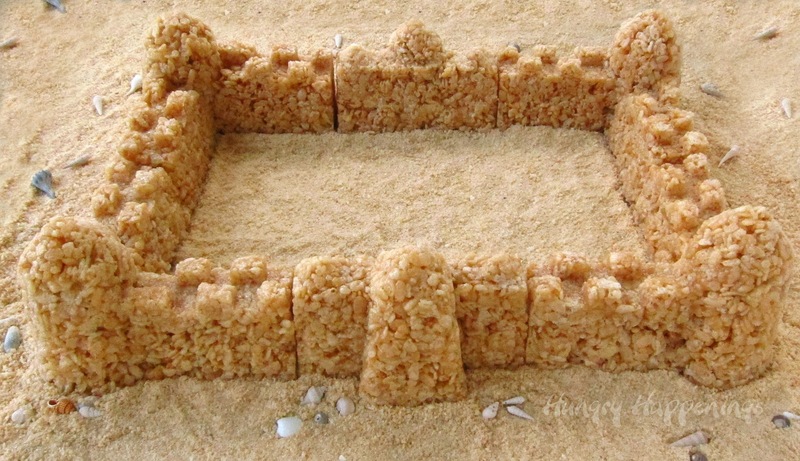 Build a castle to be the center of attention at your beach themed party! 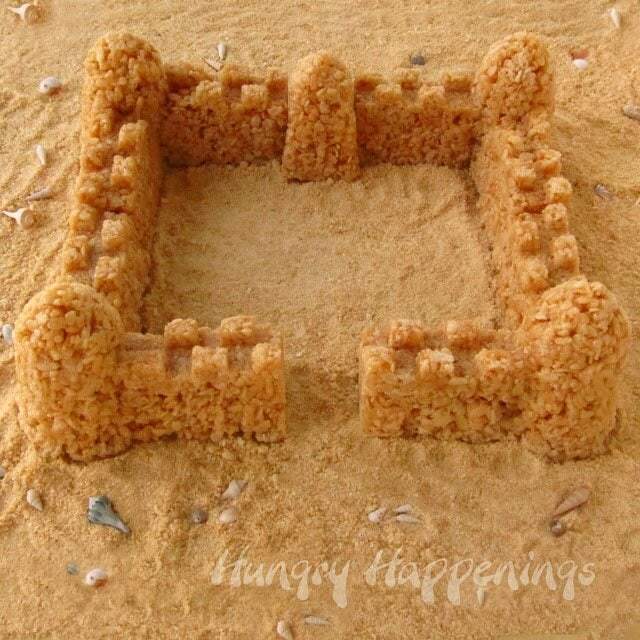 This Caramel Rice Krispies Treat Sand Castle is a simple dessert that will have your guests’ jaws dropping! A vacation at the beach wouldn’t be complete, at least for kids, without building a sand castle. I can remember spending the afternoon sitting in the warm sand listening to the ocean waves crash against the shore while shoveling sand in to buckets and sand molds and painstakingly constructing my own castle, trying to hurry before the tide moved in and took my creation back out into the deep blue sea. It’s been a long (oh, so very long) time since I played in the sand like that, but just recently I had the amazing opportunity to visit and sleep in a castle. Well, actually the building we stayed in is a 19th-century castellated house, but it was an exciting experience just the same. It looks like a castle, right? 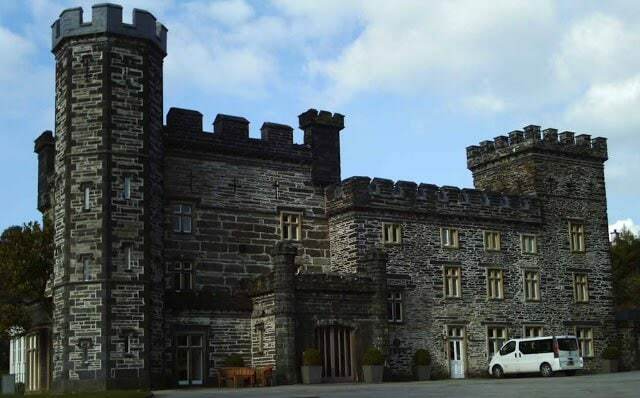 Castell Deudraeth was our home for two spectacular nights while we visited the village of Portmeirion in Wales. The village is on a cliff overlooking and estuary that leads to the Irish Sea. If we hadn’t been so busy, hiking and dining during our stay, (the food was fabulous,) we could have gone down to the beach and spent a lazy afternoon building a sand castle. Instead, I decided to wait until I got home and make one in my kitchen. I found my culinary inspiration in sand molds, once again. There are just so many clever culinary uses for those simple plastic beach toys. So far, I’ve used them to create Marshmallow Sea Creatures and Peanut Butter Fudge Starfish; today I’ll show you how to make a caramelized cereal treat using a sand castle mold. This crispy treat recipe, from Mouldings, Inc., has been in my recipe box since the early 90’s. 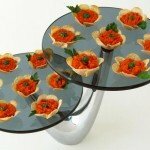 The company used to make plastic molds for the purpose of creating crispy treats, microwave cakes, jello and more. Sadly, I haven’t seen these molds in stores in many years; I did, however, find the set, pictured here, for sale on Overstock.com, if you are interested. 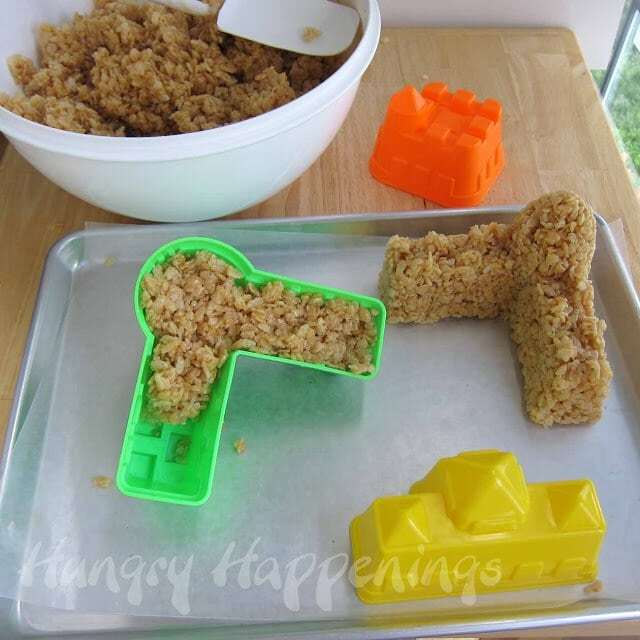 I have many of these molds, and love using them, but discovered the sand molds work just as well for crispy treats. As a matter of fact, my friend is hosting a Renaissance party this weekend so I gave her the castle to display along with her other desserts. I can’t wait to hear what her guests think about it. I tested both, the plastic wrap and the traditional recipe, and happily both worked perfectly. 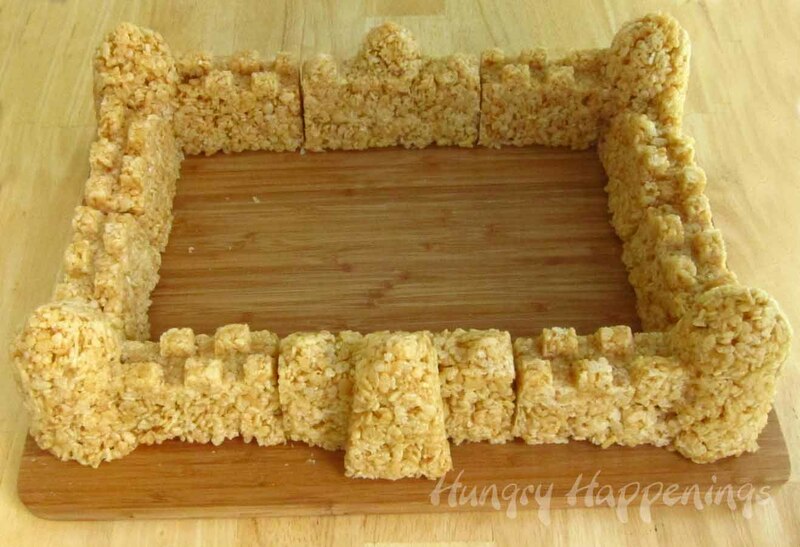 Just know that it will take 3 full recipes of the marshmallow cereal treats to create this castle. 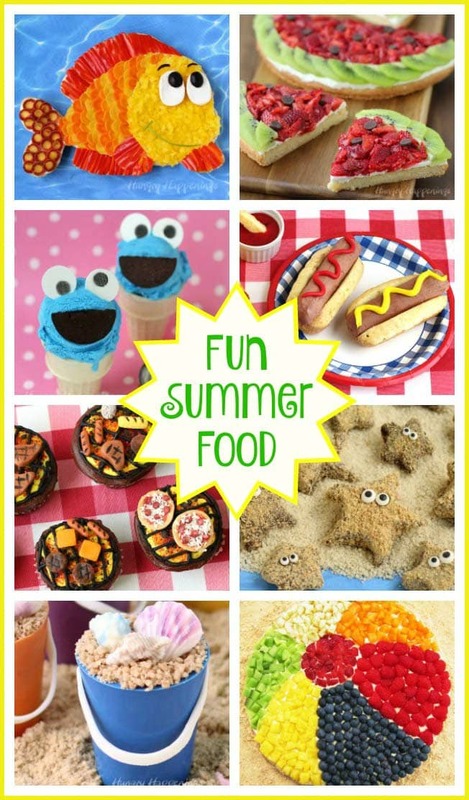 The pictures below were made using the caramel rice cereal treats in this recipe, but were molded without the use of plastic wrap. *I have found these plastic beach toys in discount stores, dollar stores, department stores and even drug stores. They are easy to find all summer long. The actual molds I used were purchased for $1.59 at the Christmas Tree Shop last summer. Pour crisp rice cereal in very large heatproof bowl. Cut butter into small pieces. Place butter, brown sugar, and corn syrup in a medium saucepan. Heat on medium, stirring as needed, until butter melts and mixture begins to bubble around the edges. Place lid on pan for one minute. Remove lid and allow to boil for 2 more minutes, without stirring. Remove from heat and add sweetened condensed milk, stir to combine. Return to medium heat and allow to boil for three minutes. Remove and immediately pour over crisp rice cereal. Don’t scrape the bottom of the pan. Use a heatproof spatula or wooden spoon to stir the cereal until it is well coated with the caramel. This mixture will be extremely hot, so be careful not to touch it. Allow mixture to cool, stirring it a frequently, until you can easily touch it. Just don’t let it cool too much or it will get too hard and wont be easy to press into the molds. LINE YOUR SAND MOLDS WITH PLASTIC WRAP AS PICTURED ABOVE!Then spoon some of the cereal treat mixture into your plastic mold. Press down firmly making sure the caramelized cereal fills all the crevices. 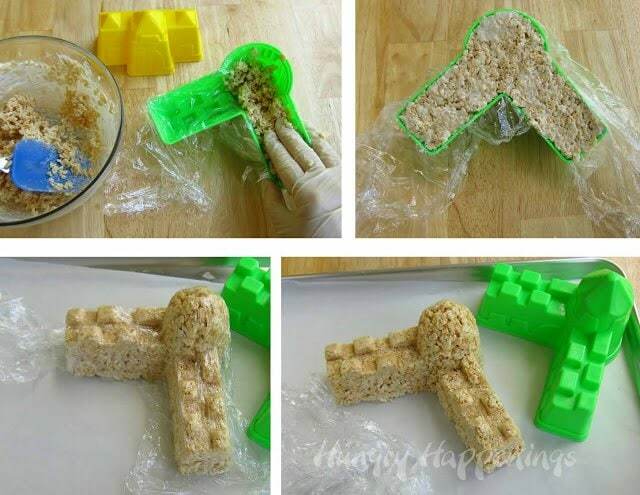 Fill each mold to the top and press down using your spatula or spoon to really compress the cereal in the mold. 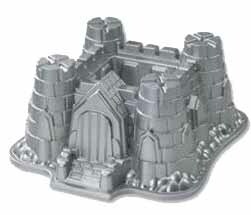 Note: I started by using a sand castle mold that was about 4″ long, but found the features of the castle wall were just too small to really show up well, so I decided to use a larger set of molds. I made the first piece, pictured in the upper right hand corner, and didn’t make sure to really press the cereal mixture into all the crevices in the mold. As you’ll see with the pictures below, I did a much better job filling the molds so all the details really showed up. I was even able to fix the first one. To un-mold the cereal treats, just turn the mold upside down and shake. The molded piece should fall right out. If it doesn’t, pull the sides of the plastic mold away from the cereal treat and shake gently and it should fall out. You can spray your molds with cooking spray, but I found it unnecessary. Assemble your castle however you’d like. My sand mold set really didn’t have much to work with; I couldn’t figure out how to add any of the square pieces (see the orange sand mold in one of the pictures above,) so my castle is just a large rectangle with a lovely large courtyard. Each set of sand castle molds will be different, so you can get as creative as you’d like with your castle. If you have one of these Nordic Ware Castle Bundt pans, you could use the cereal treat recipe in it as well. It will make a really great looking castle. Of course, buying this pan may cost more than sand molds, but the shape is really nice. I’ve included some links for castle sand molds below, but I couldn’t find the exact molds that I used. Keep your crispy castle stored in an airtight container for a week or more. 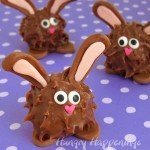 I used to make bunny shaped caramel crispy treats using this recipe every year at Easter and packaged them in cellophane bags and they would keep for several weeks. Molds that could be used for this project that are available on Amazon.com. How cool! I would of never thought to do that! Love this idea!! So fun! This is great!! Love it! Thanks and welcome, fellow buckeye! Wondering if the classic Rice Crispy treat recipe made with marshmallows would work. 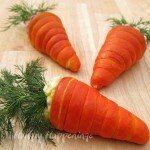 Does your recipe make a similar treat? Thanks for another creative and fun idea! I have yet to try the regular marshmallow cereal treats in the castle mold, but would assume it would work. It will just be more sticky, so I'd recommend putting on food handling gloves, buttering your gloved hands well, and really pressing the mixture into the molds. 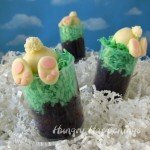 I'm just working on another sand mold cereal treat recipe that adds white chocolate to the usual marshmallows and butter so that they are easy to mold. 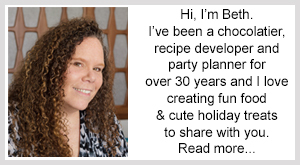 I'll be sharing it as a guest post on Sunday over at Kitchen Fun with My 3 Sons. Saw the pic on Pinterest and came over to see the cuteness. 🙂 WE have been using white chocolate in our rice crispy treats for several years. It's pretty much amazing. Good luck with your next project! Hi Charity, well, I decided to test out the traditional cereal treat recipe and it worked perfectly. It is a bit stickier, so I just buttered my gloves really well and had no trouble pressing it into the molds. I like the addition of white chocolate; it really tastes great and was easier to mold. Jill may post that tutorial sooner than Sunday. I'll let everyone know when it goes up. Could there be any issue with using the sand molds for food? I'm assuming they are not tested for being food safe, so that makes me worry a little bit. Maybe lining them with saran wrap before using them would be a little bit safer? You bring up a very good point. 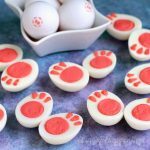 There are strict regulations regarding plastics in kid's toys as many small children put toys in their mouths, but these molds are not labeled food safe. 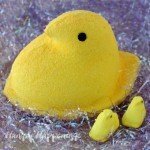 I am going to go back and change my tutorials to include the use of plastic wrap. As soon as I can, I'll re-work my pictures too. The plastic wrap might just make it easier to un-mold as well. Thank you so much for asking this question and making this suggestion. So, I just tested this out, took pictures, and added the changes to the tutorial. Thanks again, for bringing this topic up! The plastic wrap does actually make it easier to un-mold, so it is the perfect solution. This is such a clever idea!! I found you through Dorothy's link party. You have a great site. This is some amazing creativity! I would love to try this with my kiddos- stopping by from Mom on a time out hop! How great is that??? This is adorable! I LOVE this! I can't wait to try this later in the Summer! 🙂 I'd love to invite you to join us on Saturday Show & Tell at Cheerios and Lattes! I know my readers would love this idea too!